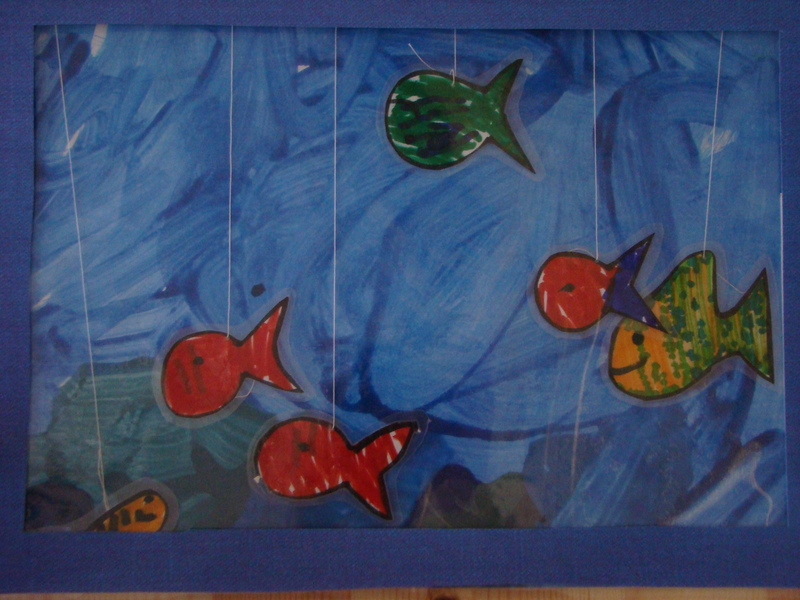 A long time ago (and I mean a long time, probably around 18 months ago) we made an aquarium with the kids out of a big cardboard box painted blue. They played with it for a long time, but eventually it got too worn and had to be “recycled” 😉 Every so often since then one or other of them asks to make one again but we’ve never got back round to it (we really must). Anyway a few weeks ago Jasmine asked. I probably would have done it this time but we didn’t have any boxes large enough, so I thought we’d make some aquarium pictures instead. I mixed up 4 different shades of blue paint, gave them a piece of A4 paper and they painted, covering the entire piece of paper with different shades of blue. Then I drew some very basic fish shapes onto some more paper and they coloured them in with felt tip pens. Once finished we cut all the fish out and I laminated them and then cut them out again, leaving a small border round each one. The following day when the blue painted paper was dry I laminated these as well. 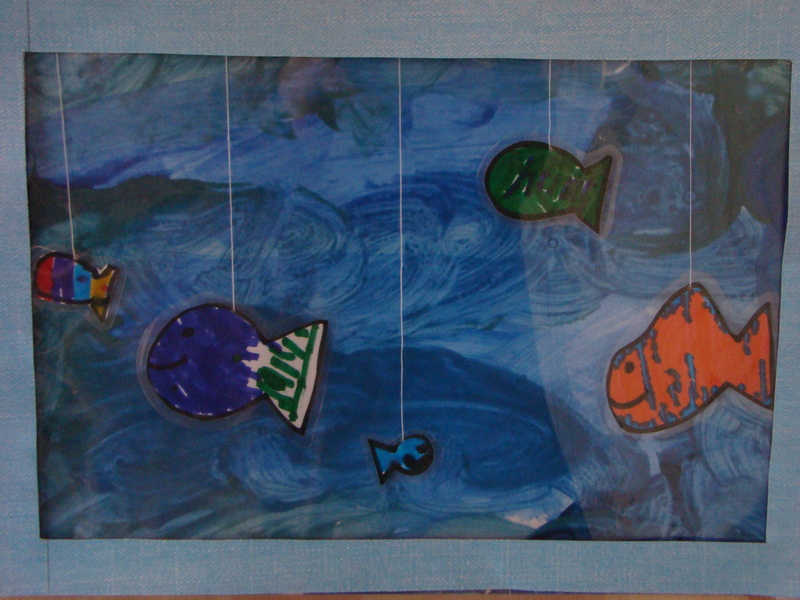 I used a sewing needle to make 5 or 6 small holes at the top of the blue paper (depending on how many fish the kids wanted) and at the top of each fish. I threaded some cotton through the hole at the top of a fish and secured it on the back with some sellotape. 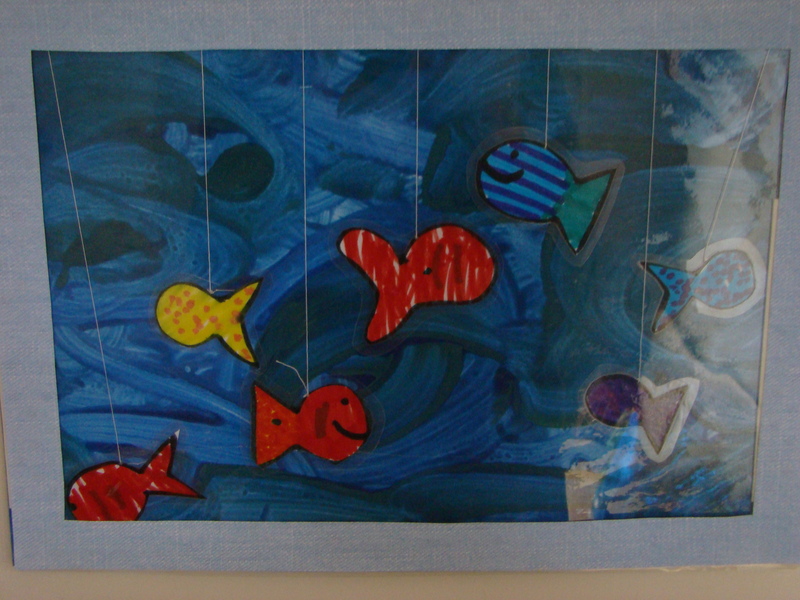 The other end of the cotton was threaded through one of the holes in the blue paper and I adjusted the length according to where I wanted the fish to “swim.” I then secured the end of the cotton to the back of the blue paper with more sellotape. I did the same for each fish to be included in the picture. Once all the fish were attached to the picture I got some Heat Resistant Acetate and stuck it to the picture using double sided padded tape on each side (leaving the top and bottom open), which gave the fish just enough room to move around between the layers. Finally I finished the picture with a border of patterned paper to cover the padded tape.